Education is the foundation upon which the development of an individual’s cognitive, psychological and intellectual faculties rests. Our CSR programme for education, Vidyadhanam, ensures support to thousands of young learners at several stages of their educational journey. TML believes education is the cornerstone of one’s cognitive, psychological and intellectual faculties. Vidyadhanam, TML’s CSR programme for education, provides support to young learners by ensuring holistic development in education infrastructure and services. The programme focusses on the academic, physical and social development of students, in conjunction with value education. It facilitates their mentoring by professionals who are experts in their subjects of interest. Encouraging students to participate in co-curricular activities ensures their holistic growth. Jointly instituted by Tata Motors and Tata Communications, the Tata Samarth scholarship is a mentor-based rolling scholarship programme supporting bright young engineers belonging to the economically weaker sections of society. Thus far, we have awarded scholarships to 50 students from five engineering colleges affiliated with the College of Engineering, Pune. These students are also being mentored by senior leaders of the two companies. We have also partnered with the IIT Bombay Alumni Association to extend financial aid to IIT-B students in need. About 40 students have been supported till now under this programme. 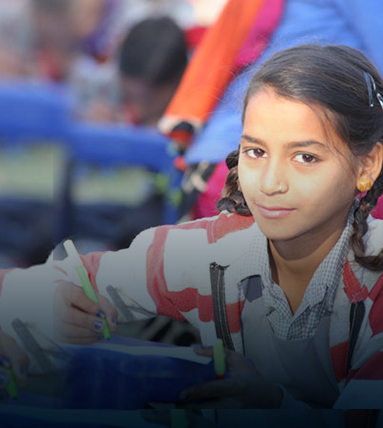 In order to tackle the issue of high dropout rates, low percentages of students passing exams and weak academic performances in the secondary school system, Tata Motors has partnered with reputed non-profits to provide quality education to students studying in municipal schools. In partnership with the Global Education Trust (the CSR arm of leading coaching class institute Mahesh Tutorials), we are providing special coaching to around 23,000 students of grades 9 and 10 enrolled in over 140 municipal schools of Mumbai. Based on the encouraging outcome of this project, we have deployed similar projects in communities around our other manufacturing locations. At some places, we have also set up e-learning technology to promote digital learning. Tata Motors has partnered with Avanti Fellows, an NGO, to support bright students of Jawahar Navodaya Vidyalaya (JNV) schools preparing for IIT-JEE and other competitive entrance exams. As part of the programme, we provide special coaching to students at JNV Mangalore and JNV Puducherry. We have also deployed innovative peer-to-peer learning pedagogy at these places. As a result of the intervention, the overall entrance exam performance of students from these schools has significantly improved.